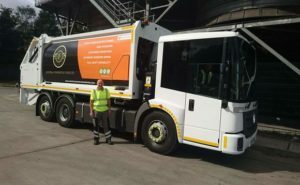 Waste collection and recycling company Veolia has created a bin lorry that is powered by the rubbish it collects. The project in Sheffield will see non-recyclable waste collected by the company burnt to create sustainable electricity. In the future, this will power a fleet of electric bin trucks, which have had their conventional diesel powertrains removed and replaced by prototype battery packs. Household waste collected by two 26 tonne RCVs will be taken to Veolia’s Energy Recovery Facility, in the Yorkshire city. Here the waste will be burnt in an incinerator situated underneath a large boiler, which generates steam to power a turbine. The project has been granted funding from Innovate UK to support the two-year trial, which will start at the end of this year.